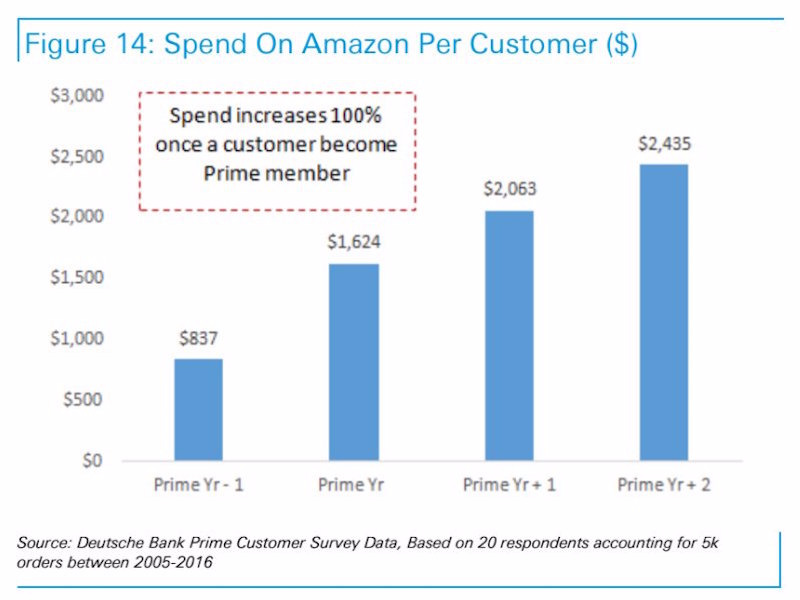 Customers double the amount they spend on Amazon after becoming a member of Amazon’s subscription service Amazon Prime, according to a new research note published by Deutsche Bank. The bank surveyed 20 Prime customers who together made over 5,000 orders in over a decade. 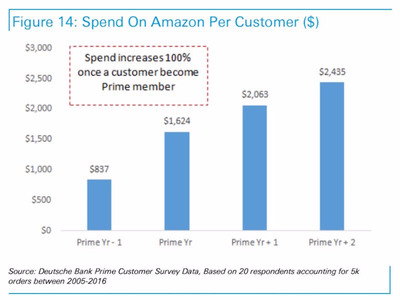 The survey found that spend increased 100% after a customer signed up to Prime. That’s exactly what Amazon wants to happen: Customers pay money for a better service, and that encourages them to buy more. The research by Deutsche Bank follows a note published by Bernstein earlier this month that estimated that Amazon has up to 69 million Prime subscribers. The Bernstein note also included some interesting details on the usage of Amazon Prime in the UK. Consumer surveys showed that Amazon Prime Video is marginally more popular amongst Prime users in the UK, with 65% of Prime members classed as monthly viewers. In the US that figure came in at 60%.